To many students graduation is a finish line, for others it may simply be the next step in their schooling, but regardless of what comes next, graduation means that you have successfully completed this portion of your life. As you prepare for your graduation we are happy to help with any and all of your wardrobe needs. At Honors Graduation we know how important this day is to you so our goal is to have you looking stunning in time for your ceremony. You have given it your all year after year, facing numerous challenges and knocking down countless barriers. I'm sure that along the way you were able to make some lasting memories and even a few friends as well. Needless to say, you deserve to be celebrated for all of your hard work during this graduation. Graduation brings family and friends together to honor those who have earned it with all of their hard work. I urge you to pause a moment at the time of your ceremony and just soak it all in, remember that you can do anything you set your mind to. Graduates are usually seen dressed in a cap and gown with graduation tassels hanging from their cap during their ceremony. Tassels are even included as tradition in a majority of graduation ceremonies. As students receive their diplomas and officially graduate they move their tassels from the left side of their cap to the ride side. Here at Honors Graduation we have the tassels that match your school colors perfectly, which is typically the color scheme that students prefer to accent their outfit with. 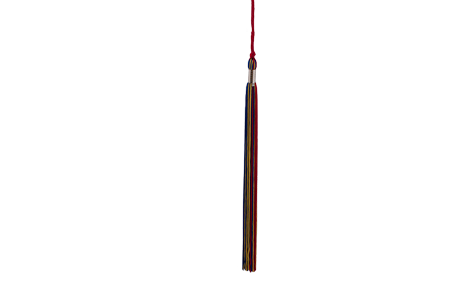 Our tassels in red, yellow, and royal blue are a wonderful set and would go great with any color of cap and gown. These primary colors would also be symbolic way for honor students to stand apart from their peers as many who have put in the extra work do.